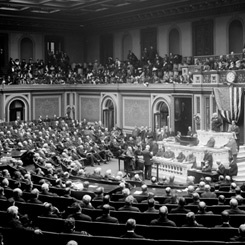 Image courtesy of Library of Congress The 64th Congress (1915–1917) returned 22 former Members to the ranks of the House Chamber. On this date, as the House began to organize itself at the opening of the 64th Congress (1915–1917), a monumental number of returning Members were sworn in. Nearly one-third of the opening day roster had not served in the 63rd Congress (1913–1915). One hundred nineteen were true freshmen, most of them Republicans who had picked up a large number of seats in the midterm election. Another 22 were Members who had lost re-election previously, many in 1912. Most of this unusual group were Republicans who had been turned out of office in a tumultuous three-party election that catapulted the Democrats to a more-than-60-seat gain in the House and propelled Woodrow Wilson to the White House. Known as the “comebacks,” these 18 Republicans and four Democrats included many former House leaders and rising stars: former Speaker Joe Cannon of Illinois, future Speaker Nicholas Longworth of Ohio, former Chairman of the Expenditures in the Department of the Treasury Ebenezer Hill of Connecticut, and future Majority Leader John Q. Tilson of Connecticut. When “Uncle Joe” Cannon lost his campaign for re-election to the 63rd Congress (1913–1915), he commented that it was not wise to speak out against the opposition after an election because of the possibility of a comeback. In 1912, he had noted, “I am satisfied to keep quiet.” Cannon’s predication proved correct; in his case, after winning re-election in 1914, he would serve a total of four more terms in the House. The “comebacks” were extended courtesies that the freshmen were not. For instance, the Democratic committee chairman of the Ways and Means committee made concessions to help ease these House veterans’ return to their former committee assignments—though they did not regain their seniority. Moreover, fellow Members from both sides of the aisle warmly greeted the “comebacks” on the opening day of the new Congress, before the House got down to business—as more than new 2,000 bills were introduced before the end of the legislative day.